Good news! Tachyon is relaunching our website and blog. For the time being we'll be posting updates on our Facebook page. Happy holidays to all - we'll see you in 2013. But wouldn't you rather see him as Galadriel? You've only got until Monday morning, so go donate! Happy (almost) Thanksgiving, everyone! This Thanksgiving I'm thankful for food, family, and a long weekend I can spend curled up with a good book. 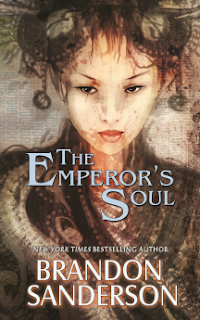 Check out this excerpt of The Emperor's Soul if you haven't already. If you're new to Brandon Sanderson, The Emperor's Soul is a great place to start. It's just the right size for a busy holiday, and will definitely whet your appetite for the rest of his work. And if you're a fan, you already know Sanderson does not disappoint! "The forgery was a masterpiece, an almost perfect replica of a priceless work of art. The minor inconsistencies were all but impossible for even an expert to detect. However, Shai had been betrayed. Now awaiting execution, Shai would be reprieved if she could do the impossible. As a Forger, Shai is a skillful artist who can apply complex magical glyphs to rewrite the history of the item to change it completely. Although Forgers are despised, the Empire needs Shai to accomplish the unthinkable: to Forge a new soul for the Emperor. Verdict: Sanderson, the best-selling author of the “Mistborn Trilogy” and The Way of Kings, has set this novella in the same world as Elantris, one of his earlier novels, but it is totally independent. Fantasy fans will love both the compelling story and the creative magical setting." 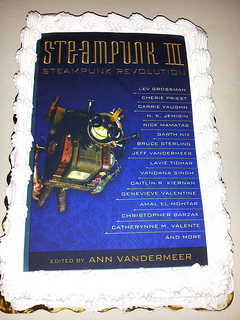 Courtesy of Ann and Jeff VanderMeer, we bring you incriminating photos of their infamous Steampunk party at the 2012 World Fantasy Convention. 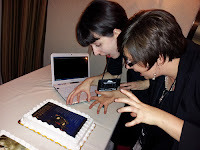 Pictured here are, to the left, the amazing Steampunk Revolution cake and to the right, Karen Tidbeck and Genevieve Valentine's extremely appropriate reaction to it. Publishers Weekly has released its list of the Best Books of 2012. 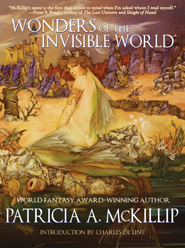 There's something for everyone on this list, but our eyes are on Patricia A. McKillip's Wonders of the Invisible World. You can read PW's original starred review of Wonders here. So remember, election day is over, and whether your guy won or lost, the best celebration/remedy is to curl up with a good book. Congratulations to Tim Powers on his World Fantasy Award for The Bible Repairman. We're also chuffed to see WFAs go to John Coulthart, designer of several of our gorgeous Steampunk titles, and Jeff and Ann VanderMeer for their magnum opus (so far), The Weird. While you're waiting for your copy to arrive (or re-reading the one you have), here's a quick roundup on what reviewers have said about The Bible Repairman. Do you prefer your fantasy subtle or bold? Our two new November books are perfect for *all* of the fantasy readers on your holiday shopping list. Is it possible to create a forgery of a soul so convincing that it is better than the soul itself? From Brandon Sanderson, the bestselling author of the Mistborn Trilogy and co-author of the final three books of Robert Jordan’s Wheel of Time series, comes the tale of Shai, a heretic thief who is the only hope for the survival of an empire. Shai is a Forger, a foreigner who can flawlessly copy and re-create any item by rewriting its history with skillful magic. Though condemned to death after trying to steal the emperor’s scepter, she is given one opportunity to save herself. The fate of the kingdom lies in one impossible task. Epic fantasy is storytelling at its biggest and best, from the creation myths and quest sagas of ancient times to the mega-popular fantasy novels of today. Now acclaimed editor John Joseph Adams (Wastelands, The Living Dead) brings you seventeen tales by today's leading authors of epic fantasy, including George R. R. Martin (A Song of Ice and Fire), Ursula K. Le Guin (Earthsea), Robin Hobb (Realms of Elderlings), Kate Elliott (Crown of Stars), Tad Williams (Of Memory, Sorrow & Thorn), Patrick Rothfuss (The Kingkiller Chronicle), and more. One thing’s for sure—your adventure will be epic. Want to read an excerpt from Brandon Sanderson's new novella, The Emperor's Soul? Done! Tor.com has posted the prologue and first chapter for your enjoyment, which you can find over here. Emperor's Soul could not wait to get on shelves, so as soon as it was printed it escaped from the warehouse for an early release. That means it's available now! Good news, because once you check out the excerpt you will need to keep reading. "A researcher goes back in time to visit Cotton Mather and finds the preacher’s visions are not what he expected in the title story of McKillip’s (The Bards of Bone Plain) latest collection of mesmerizing short fiction. From the deliciously macabre retelling of “The Twelve Dancing Princesses” to the elegant story of courtship and obsession depicted in “The Kelpie,” the 16 stories collected here display the author’s talent for creating tales both delicately beautiful and heartbreakingly cruel. The text of her Guest of Honor speech at WisCon 2004, included within, offers valuable insight into the mind of the writer. VERDICT: Any collection of McKillip’s short stories will be a valuable asset to any library and a joy to her many fans."